When we hear the term ‘artificial intelligence’ or ‘AI’, it is easy to imagine scenes from movies that depict robots smarter than us plotting to take over the world. While it is easy to have a dystopian view of AI, the reality is actually quite different. The road ahead with AI is one that is rich with possibility and near limitless benefits. 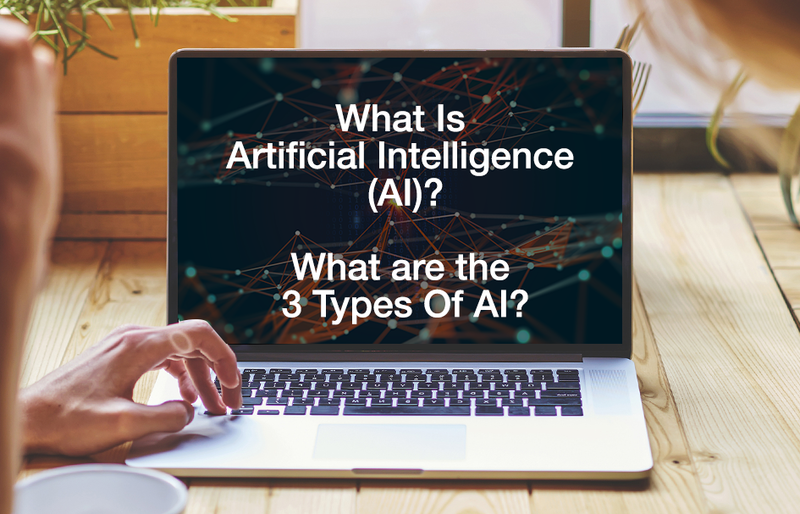 In this article, you will get to understand what exactly is artificial intelligence, the 3 main types of AI and how we will be embracing AI technology in our everyday lives. For close to a decade, AI has been actively helping our world become more efficient and transforming productivity by making mundane and tedious tasks infinitely easier. While scientists and technologists today are utilizing AI to help solve critical world issues that include climate change, food security and disaster response, AI is already transforming our daily lives without us even realizing it! Online retailers like Amazon are using AI to improve our shopping experience through purchase prediction & product recommendations. They utilise AI to analyze our buying history, the current product we are searching for, all while referencing data from millions of historical purchases from other customers to bring to direct our attention towards suggested products that we will probably like and possibly buy. Take financial services for example. Most of us conduct our banking online today and it’s easy to understand why – long queues and even longer wait times. But with all that convenience lies a big weakness – the lack of customer service online. Banks like HSBC Holdings, Hang Seng Bank and Standard Charatered have developed AI-powered chatbots to help instantly answer customer’s immediate queries from opening an account to getting a loan and applying for life insurance. Thanks to the power of AI, chatbot services are now providing customer service to the clients of businesses, with 24/7 support, anytime and anywhere. At its core, AI is the ability of a technology or machine to operate in a way that resembles how human beings behave and operate. This includes human levels of reasoning, learning, problem-solving and even the expression of creativity. From Netflix’s movie recommendations to AIVA, an artificial intelligence that composes emotional soundtrack music for orchestras, the applications of AI is truly vast and possibly limitless. One key aspect of AI that truly resembles us humans is the ability to learn and adapt. We are not perfect and neither are machines. Similar to each of us, the AI system takes in data, learns from it and stores it away for future reference. Take for example a young child who touches a hot kettle. Their brain registers the pain and takes note not to repeat the same action that will cause hurt. AI functions in the same way but with the added ability to learn and adapt at a much faster rate constantly. AI strives to evolve to the point of one day being indistinguishable from actual humans, allowing the user to experience seamless communication and interaction. As the prominent computer scientist & inventor, Ray Kurzweil puts it “Many thousands of AI applications are deeply embedded in the infrastructure of every industry.” While there is a multitude of AI applications today that includes learning, perception and creative expression, they can be categorised into 3 different types of AI. This is perhaps the most common and least sophisticated of AI technology. It is focused on the study of pattern recognition to make predictions about data into the future. Recall those Amazon product recommendations? That is a wonderful application of machine learning at scale. It allows Amazon to recognise your shopping patterns and make predictions about what you are likely to buy in the future and makes relevant recommendations so that you can easily find the product you seek. Deep learning is the next step. It combines all the data and inputs received to perform complex tasks. Just imagine, a fridge that tracks the type, quantity and brand of food that you buy every single day. It takes and stores and learns from all this data to the point that one day when you run out of your favorite brand of bottled milk, it automatically places an order online for you. Iconic companies such as Samsung are embracing and integrating deep learning AI into their fridges to take our experience with everyday household appliances to the next level of intelligent application. Another interesting use of deep learning AI is the ability to colorise black and white photos into colored ones. Colorisation plays an important part in preserving our history and giving us a glimpse into how the past looked like to people inhabiting that era. Previously a rather tedious and manual task given to skilled experts, AI is helping to allow the colorisation of pictures at scale, allowing us to recapture more key moments of our history in color. Perhaps the most exciting frontier of AI, a neural network mimics real human biological networks that not only self-learns and develops its own knowledge but also unlocks the understanding of human language to communicate back with us. Have an iPhone? Deep within it lies Siri, Apple’s voice assistant that is powered by a Deep Neural Network (DNN) AI. This AI converts the acoustic pattern of your voice into data and information where it can process your request and in return delivers an answer to you, spoken back like a real human being. With the ability to learn and self-adapt rapidly, the application of AI goes beyond just better shopping experiences and customised entertainment. AI today is being used to solve problems that could change the course of history and our lives forever. Education is key for living a richer and more fulfilled life, however, every student learns at a different pace and educators from high schools to universities are facing the challenge of maximising every student’s potential. Pearson, the world’s leading education company, predicts that each and every student will have a life-long learning companion. An AI that has been with the student throughout his or her school career and is intimately familiar with every subject and course they have taken. This will allow the student to identify areas which need improvement while the AI maps out a customised learning plan that helps to accelerate learning exponentially. Additionally, AI will help educators teach better in the classrooms. Rather than wait till the end of an examination, teachers will be able to monitor the students’ progress in real-time with the AI recognizing when a lesson or topic has to be retaught. When it comes to our health care, it is largely believed that real human doctors should make the diagnosis and dispense the right treatment – but all that is starting to change. Today AI is outperforming real human doctors in cancer detection, and when it comes to our health, getting the right information early is key to successful treatment. Led by Dr. Yuichi Mori of Showa University, Japan, scientists have developed an AI software that can detect colorectal cancer in its earliest stages with 86% accuracy. This type of cancer is fatal if left undetected but early detection is often difficult. A separate team from France, Germany and the United States taught an AI system to accurately detect skin cancer and outperformed human dermatologists globally. When put to the test, the skin specialists detected 86.6% of skin cancer from given photos of patients compared to a 95% detection success rate by the AI system. As the world becomes more complex, companies and organisations are beginning to adopt and integrate AI into their businesses and products to solve a mountain of ever-evolving challenges. Sure, the idea of fully embracing AI might seem a little scary, after all, will they eventually surpass human intelligence without us even knowing? In truth, we should look into the future with positivity as the great thinkers of our age today including Bill Gates are also active advocates of AI and are hopeful the rise of this technology will unleash a new wave of productivity, allowing society to do more with less. At New Digital Noise, we embrace the rise of artificial intelligence in Hong Kong and see it as a great tool to help us live better. From utilizing AI to combat against advertising fraud to the development of AI Chatbots for international banks that include Hang Seng Bank in Hong Kong, we celebrate the new coming age of artificial intelligence advertising and the exciting possibilities to come! Looking to learn more about AI? You can discover more at our blog here.